To say a lot of new restaurants have opened recently in D.C. is an understatement. The city has seen an explosion of new dining options in the past 12 months, particularly along corridors like 14th Street NW and H Street NE. The Shaw neighborhood is another such place, where Table is perhaps one of the buzziest openings of all. Bon Appétit nominated it as one of America's 50 best new restaurants this year (along with Daikaya, the other D.C. spot on the list) and the Washington Post awarded it 2.5 stars. 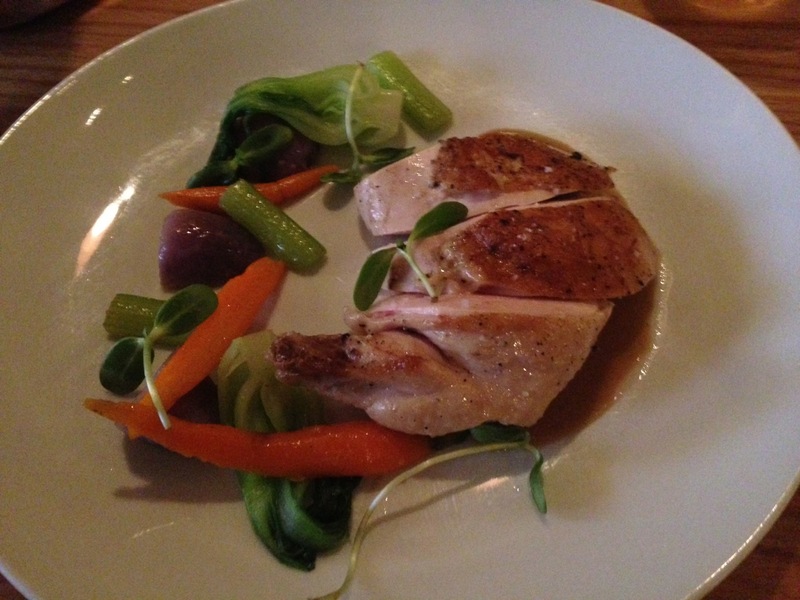 Like a lot of restaurants these days, Table places its emphasis on serving quality, seasonal ingredients. Aspects of the restaurant may seem "high concept," like its menus. Initially, it was reported that Table wouldn't have a printed menu, but would project it on the wall, a cost-saving and efficiency measure to make updating the constantly changing menu easier. That was apparently scrapped in favor of another unusual menu: hand-written. If that sounds a bit complicated, the food itself is not. Some dishes may lean a little French or Italian, but they all speak the same language of seasonal and simple. Those expecting an extra flourish may be disappointed in the lack of obvious "wow" factors, but the food that came out of the nearby kitchen excelled at highlighting the flavors of the key ingredients. We started the evening with the burrata mozzarella and tomato dish. The burrata, a trendy cheese these days, was typically creamy and had a nice tang. 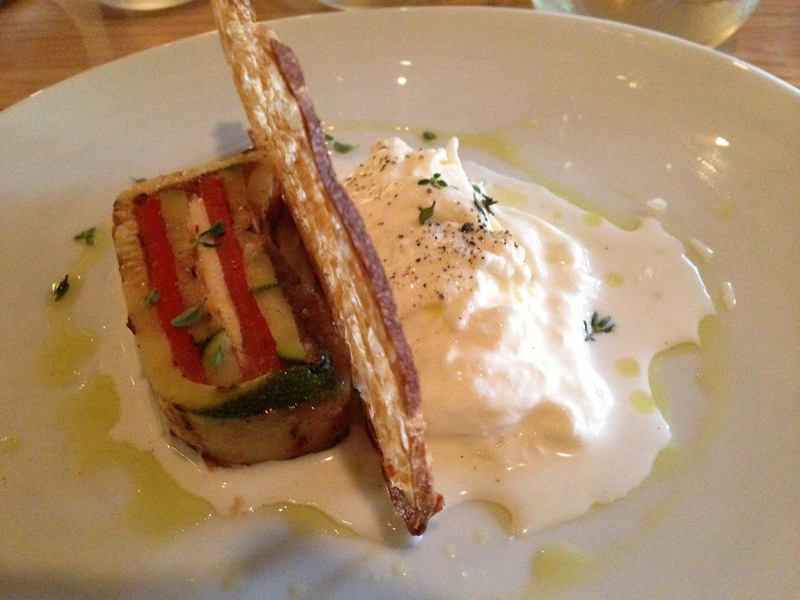 It came served with a wafer-thin slice of toast and grilled zucchini and anchovy terrine. If you're not an anchovy fan, be warned: the terrine had thick slices of the meaty cured fish, which I enjoyed, but Chris found too fishy. This time of year, good-quality tomatoes need little else to supplement their good flavor. 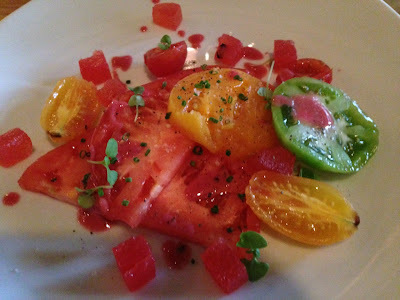 So the tomato dish, with its accompanying cubes of watermelon and sprinkle of herbs, was appropriately simple. The slight crunch of sea salt and a sprinkle of herbs the only accoutrement to the ripe tomatoes and refreshing melon cubes. Our entrees were similarly simple: a protein accompanied by side vegetables. No special extras, but none were really needed. 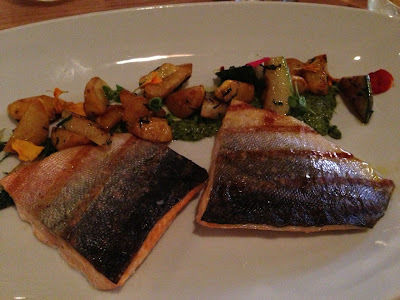 The Arctic char was perfectly cooked. The skin was crispy the flesh was tender, moist and cooked through. Although Guinea hen was on the menu, our server explained that it was out--no doubt a not unusual issue at a restaurant striving to serve only the freshest available ingredients. In fact, there was a somewhat lengthy discussion of menu substitutions at the beginning of the night. Chris opted for a non-menu item: the crispy skin roasted chicken, a juicy (probably brined) chicken breast and wing served with braised mixed vegetables. With either entree, I wouldn't discount the vegetable sides. They were not afterthoughts, but very good on their own, especially the summer squash with my fish and the braised celery with the chicken. This is a kitchen that obviously loves its vegetables as much as its proteins. 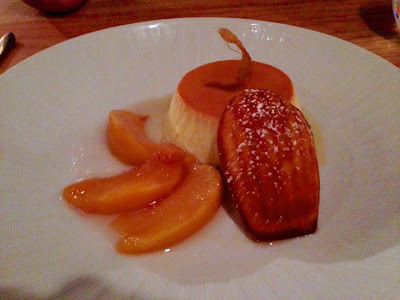 The flan dessert was similarly good and had a perfect texture that balanced nicely with the poached peaches and madeline. Although billed as "ginger" flan, It tasted to me more of vanilla than ginger, apart from the fried ginger garnish. The peach madeline that accompanied was a nice touch. So let's talk about that kitchen. It's in the dining room. Not an opening into the kitchen, but literally in the same room. Thus diners can watch Chef de Cuisine Patrick Robinson and his cooks as they work (Chef Frederik de Pue was not on hand, perhaps he was at his other restaurant Azur, which opened in Penn Quarter shortly after Table's opening). As an avid home cook, I also liked seeing all their kitchen equipment on display on large open plywood shelves against the far wall. In addition to the kitchen, the minimalist space has other appealing elements, including a glass-paned garage door that hints at the space's former life. Looking out those windows and into the recently gentrified surroundings, I wondered what used to exist at 903 N Street NW. Not the recent previous owner, a late '00s cocktail bar called The Space, but "back in the day." One area I thought the restaurant could use some work it was with the service. There were no problems--people were polite and our food arrived as expected--but I felt like there was a lack of engagement. In particular, after receiving our food, no one came back to check on us. Although there were no problems, this is an important step to make sure diners are satisfied that everything is in order and nothing else is desired. It's also a nice opportunity to learn more about the food, if you're so inclined. Just the previous day I'd eaten lunch in a restaurant where the server's return visit to check on me led to a great discussion about how the restaurant prepared the chicken I was eating. I would have welcomed the opportunity for similar interaction at Table. Given the closeness of the diners and staff, it was a bit surprising to also have this feeling of distance. Table is a nice addition to the rapidly changing space around the D.C. Convention Center. It's nice to see independent restaurants filling a region that could have easily been dominated by boring chains. Despite it being an area likely to draw a lot of travelers, it's nice to see locals are also being catered to. Perhaps travelers would be delighted by it too. 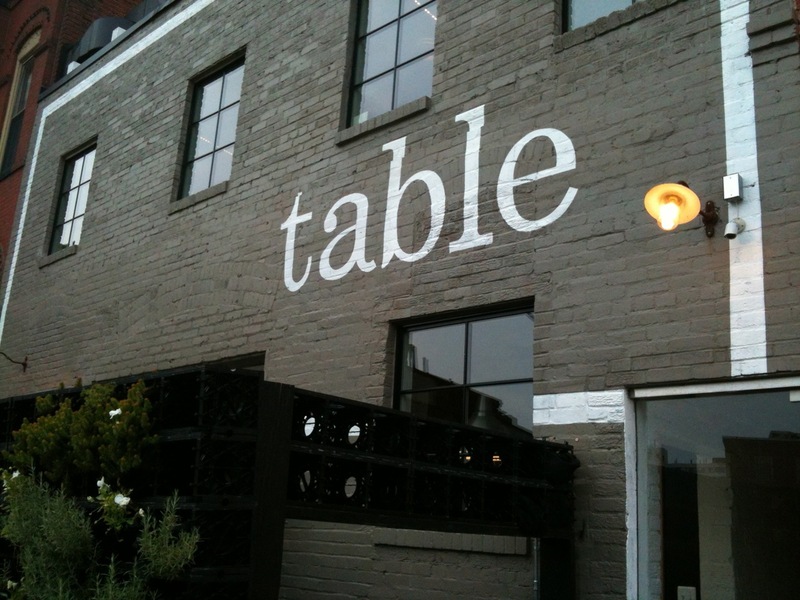 Table, 903 N Street NW (9th and N), Washington, D.C. (Shaw, near Convention Center Metro). (202) 588-5200. Reservations: Open Table. You've done a nice job describing our experience here. I agree with everything you wrote, especially your comments about the servers.